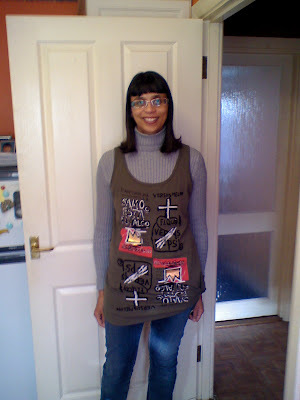 A little while ago, the gorgeous Marian at House of Style did a lovely post on 'Art on my back', which inspired me to do this post of 'Art on my front'!! Last Spring, whilst on a London shopping trip, I purchased two t shirts from Uniqlo-they were 2 for £20, which was a really good deal. Both of them have prints by the late Jean-Michel Basquiat, who was a leading figure of American pop art and a grafitti artist superstar in the 1980s. He sadly died of a heroin overdose in 1988. A film was made of his life and his work is highly sought after. So, after seeing Marian wearing her artwork, I thought I'd wear one of my tops over jeans and a polo neck as a layering piece. Both have a side slit, so can be knotted, a la 80s style. Chloe Sevigny modelled the collection last year when it came out on sale-this is also my other Uniqlo top. Do you have a work of art that you can wear? I loved that post by Marian and love yours. I live grafic prints and wouldn't mind wearing art on my front or back. Yours really looks great. I *AM* the work of art. I don't currently own a piece of art , but I'm definitely looking to purchase something of that sort. Superb top, Sharon. Oh, yes I have an artistic creation pieces. I'm ICON's creations fan. Do you know them? ( http://www.iconshoes.com/ ) Artistic creations on bags and footwears. I have a matching bag and a sandal. Hi Lenya-thats lovely of you, thanks a lot!! Hi Wendy-I would agree anyway-you are a true inspiration!! Hi LaMimi-thanks for your lovely comment!! Hi Janet-Your bag and shoes sound fabulous, thanks my dear! Love your work of art, very cool! ooohh i just love Basquiat. That tank is great--the knotted side gives it that great 80s feel that goes so well with the print. I would totally wear it as a dress too for a night out! Hi Tanya-yes, maybe in summer I'll be daring enough to wear it as a dress!! love the basquiat on you, and the side knot is inspired - perfect 80's! my husband painted a bunch of ties years ago, i should start wearing them. How fun to wear a Basquiat! I don't have any traditional visual art printed on clothing, but I bought a sweater in Tasmania that is so gorgeous I consider it to be a work of art. Does that count? Hi fashion herald-that would be such a cute look, go for it!! Hi Sal-I say so, that would be lovely to see my dear! Nice! I love the eighties! I have a pretty art-y tie-dye dress that I just bought . . . haven't summoned the courage to wear it yet but you are inspiring me! you look great. i don't think i have worn art in a while. Hey, that top looks fab. I hope uniqlo do another similar rnage this year as i missed out last time. Ary farty hey!! Only joking of course - tres cool ma dear! But still too cold to do without polo!! i do actually! i have a screen print tee of a water colour by this modern artist. it's so beautiful! Oh my gosh- I love your tee! As an art history major this is right up my alley. Sadly, we don't have Uniqlo in Atlanta- le sigh. Oh my gosh Sharon I LOVE LOVE LOVE LOVE that t-shirt on you!!!! I am a BIG BIG BIG fan of Basquiat's work my dear. I missed out on the tees by uniqlo with his prints so its SUCH a pleasure seeing this post. ADORE how youve worn this sweetie.youve made my day dear! Hi Couture Carrie-your dress sounds lovely, do wear it soon!! Hi Em-I came across it by accident, so I was really pleased, thanks! Hi kate-too right!! I daren't go bare for a long while yet! Hi La Couturier-Yours sounds lovely my dear! Hi Asian Cajuns-thanks for such a lovely comment! Hi Marian-Wow, thanks so much for such a lovely comment, always much appreciated from you! Hi Eri-wow, that sounds lovely, hope to see you in it one day! Hi Pretty Little Pictures-thanks so much my dear! Hi atelier-it sounds lovely my dear!! Lovely top and you look great my dear. Hi the seeker-thanks so much! that shirt looks gooood. has a punk - ish look.